Winter is my favorite part of the year for astrophotography. As nights getting longer and colder, some fantastic astronomy objects start to appear on the Southern night sky. As Summer Milky Way is probably the most popular astrophotography topic, the Winter sky is the most colorful and diverse. Dress warm, grab your DSLR and telescope, and shoot these 5 Winter astrophotography targets this season! P.S. 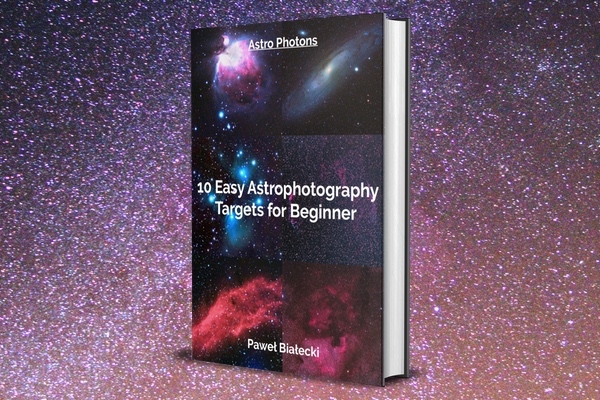 If you like PDF eBooks (and especially those free ones), check out my 10 Easy Astrophotography Targets for Beginner. The Orion Nebula and its companion, the Running Man nebula (blue nebulosity above the Orion). I shot this picture with my SkyWatcher Evostar 72ED telescope, Fuji X-T20 camera, and Fornax LighTrack II equatorial mount (check the complete equipment list at the end of the post). The king of the Winter sky can be only one – please welcome the Orion nebula! This bright diffuse nebula is THE beginner astrophotography target. 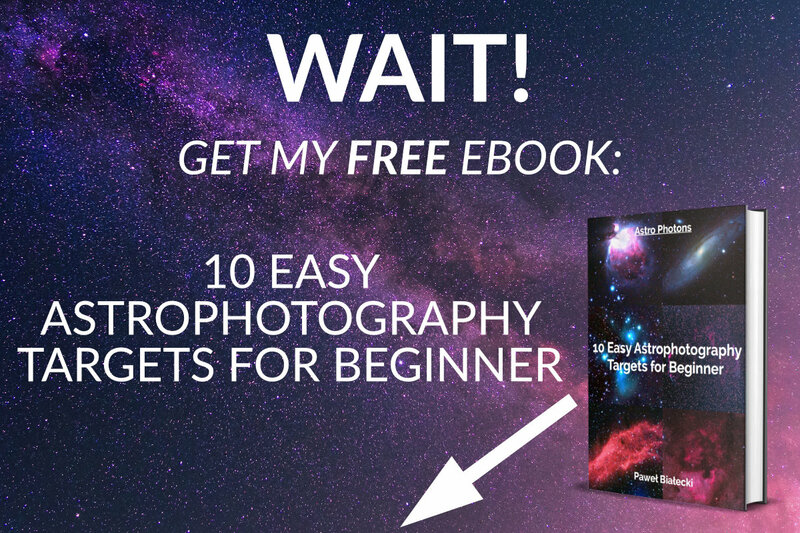 It’s visible with a naked eye, it’s very easy localizable, and you can shoot it with almost any fast lens or telescope – the Orion area is so rich in astrophotography treasures. Finding Orion is really easy because it’s one of the most prominent and most recognizable constellations on the sky. Also, it lies just next to the Sirius, the brightest star on the night sky. Look South for a diamond-like structure; Orion Nebula is there. If you have trouble locating celestial objects on the night sky, use some astronomy apps for your smartphone. The Pleiades star cluster, also known as Seven Sisters or Subaru. Another very bright object on the night sky, the Pleiades star cluster appears like a little cloud made from stars, even from the center of a moderately-sized city. Thanks to its large size on the sky, the Pleiades star cluster is a perfect target for a small APO telescope. To find out more about how to locate and what camera settings to use for the Seven Sisters star cluster, check out my post on how to photograph the Pleiades star cluster. Flame and Horsehead nebulae, the most colorful area of the Winter night sky. It’s simply stunning. One of the most colorful areas on the Winter night sky, the Flame and Horsehead nebulae are favorite Winter astrophotography targets for many astrophotographers on the world, including me. The most recognizable object of the area is, of course, the head of a horse. Be sure to take many subframes to get as much detail of it as your equipment can! Adding an H-alpha data to your RGB image will greatly improve the quality of your photo. And be patient with imaging – the higher the Orion constellation is on the sky, the less light pollution you will have on your picture. California Nebula, one of the strongest H-alpha emitters on the night sky. Using an H-alpha filter you can photograph this target even from a Bortle red zone during a full Moon. The California nebula is a perfect target for your H-alpha astrophotography setup, but even imaging in RGB-only gives fantastic results. You don’t need a big telescope for photographing this nebula, as it’s size on the night sky is relatively huge. Even a telephoto lens (200mm-400mm focal length) will reveal a lot of hidden details of this fantastic beginner target. It’s high in the sky, so light pollution shouldn’t be a big deal. The Rosette nebula picture here is another perfect example of an astrophotography target that could greatly benefit from imaging in H-alpha, like the California and Horsehead nebulae pictures above. It’s a quest for my next Winter astrophotography session, as my current picture of the Rosette Nebula above is a stack of RGB data only (but let’s be honest, astro pictures are never complete – you can always add more and more data). All the pictures above were shot with my mobile widefield astrophotography setup below, usually from my balcony. I don’t see the Polaris from here (balcony to the South), so my polar alignment is never close-to-perfect, but even then I’m able to catch some quality photons at Winter. I process my data in PixInsight and Affinity Photo on macOS. My current DSLR (a mirrorless, actually) astrophotography setup. Better cabling is on my todo list. What other Winter astrophotography targets would you add to this list? Let me know in the comments section.